It's hard to imagine that a little under a year ago, I launched the Detective Kay Hunter series with Scared to Death. I couldn't have foreseen the effect that book and the series would have on my life this past year, nor the hundreds of readers that took the time to buy and review the book, and who have kept in touch with me these past 12 months. It really has been a joy, so thank you. 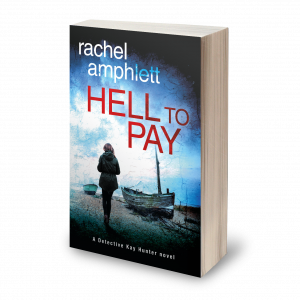 Today sees the release of book four in the series, Hell to Pay, and I'm really excited to share this with you. Hell to Pay is available worldwide in eBook and paperback, with the audiobook to follow in early January 2018. I'd love to know what you think when you've had a chance to read it!